William Berry Morgan, son of Phoecian Morgan and Elizabeth Morgan, was born 16 Apr 1858 at Hartford, Ohio County. He moved to Denver, CO prior to 1900. Mr. Morgan married Lenora “Winna” Thomas 24 Apr 1891 in MO (she was born 1864, died 16 Mar 1947 in Los Angeles, CA). 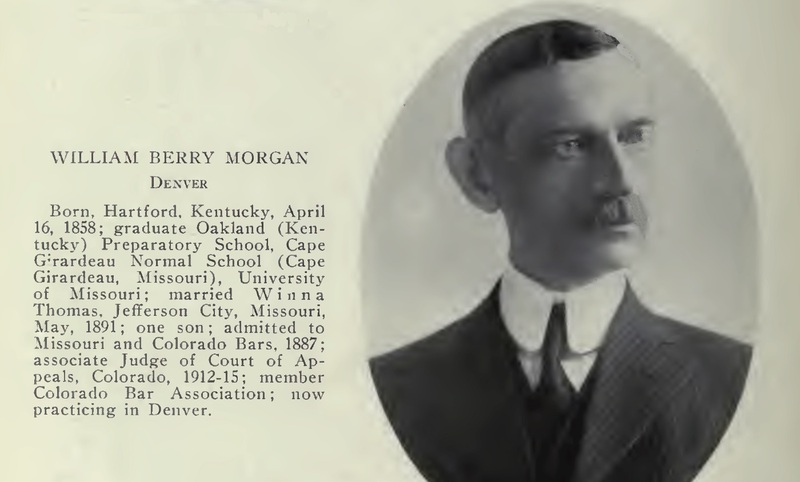 Mr. Morgan died in Denver after 1925 and before 1930 (see 1930 census for W. B. Morgan, Denver). Mr. Morgan and Winna had one son, John T. Morgan, born Jan 1892, and one daughter, T. Winna born 1912 (see 1930 census).